TORONTO, May 22, 2014 /CNW/ - Corby Spirit and Wine Limited (TSX: CSW.A, TSX: CSW.B) today announced details of a sponsorship program that will support golf tournaments across Canada that are hosted by Corby's national and regional on-premise partners. As part of the partnership, Corby will manage a 'responsible drinking hole' which will provide an opportunity to raise the awareness amongst its on-premise partners about Corby's approach to responsible drinking and share responsible drinking tips and information with individuals participating in the tournaments. The announcement is part of the fourth annual Responsib'All Day, where Corby and its majority shareholder Pernod Ricard stop business for the day to promote responsible drinking with its employees around the world. Responsib'All Day provides an opportunity to highlight yearlong Corby and Pernod Ricard initiatives and share the five key 'Global Action' commitments undertaken by the spirit and wine industry. 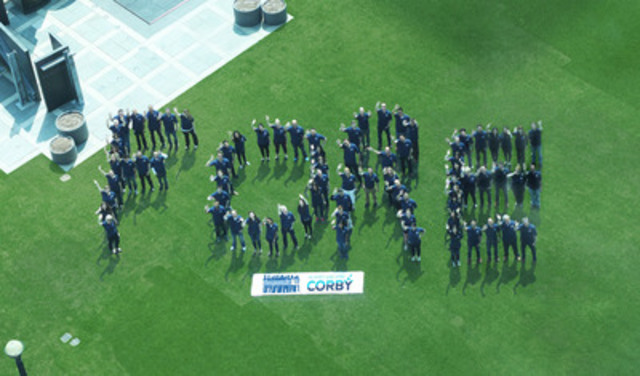 "Today's sponsorship announcement is part of our ongoing commitment to share Corby's approach to responsible consumption with our on-premise partners," said Patrick O'Driscoll, President and CEO, Corby Spirit and Wine. "Last year's partnership with the TTC supported the fourth 'Global Action' commitment of reducing drinking and driving and this year we are proud to support the fifth commitment by working with our employees and some of the most influential on-premise partners in Canada to educate Canadians across the country about drinking responsibly." In addition to the sponsorship announcement, Corby will also launch a new innovative solution to promote responsible drinking through its partnership with Alcohoot, the world's first smartphone breathalyzer. Alcohoot gives drinkers an accurate smartphone breathalyzer that enables users to easily track their blood alcohol levels and supports their decision to enjoy alcohol responsibly. As part of Responsib'All Day, Corby will provide the device to each of its employees and showcase it to on-premise partners across Canada at the golf tournaments throughout the summer. This is the first collaboration between a spirit and wine company and a breathalyzer company and will encourage people to enjoy alcohol in moderation, become smarter drinkers and enhance their drinking experiences. "We are so excited to be partnering with Corby to provide a tool that engages smart drinkers who aspire to stay within their personal limits," said Lisa Willey-Knierim, CEO, Alcohoot. "Alcohoot allows for greater enjoyment while empowering users to remain in control whenever and wherever they are enjoying a drink." Responsib'All Day is the culmination of Pernod Ricard's actions to promote responsible drinking. This event is based on an original idea: to make Pernod Ricard's 19,000 employees in 80 subsidiaries around the world the leading ambassadors of the Group's commitments. During this day. when the Group's activity stops all around the world, a multitude of local initiatives and events allow employees to talk directly with customers, distributors and consumers about the 5 commitments made by the 13 signatories in the wine, spirits, and beer industry, since October 2012 during the ICAP* International Conference on Global Actions. To mark Responsib'All Day, Pernod Ricard has launched 'Wise Drinking" a free mobile application to educate consumers about responsible drinking. Thanks to this new application, which is available in 37 languages on iPhone and Android, users are able to calculate the number of units of alcohol they consume in real time. The application takes into account the type of drinks consumed (wine, spirits or other), their volume, as well as the user's gender and weight. This breakdown enables users to track their consumption over a given period of up to four weeks. With a geo-localization system, the application adapts itself to applicable local law and then informs the consumer of the nearest suitable means of transport. Pernod Ricard has made education about responsible drinking the core of its CSR approach. The Group believes that it is through raising awareness of the risks and through active education that responsible long-term consumer behaviour can be achieved. Corby Spirit and Wine Limited is a leading Canadian marketer and distributor of spirits and imported wines. Corby's portfolio of owned-brands includes some of the most renowned brands in Canada, including Wiser's®, Lot 40®, and Pike Creek® Canadian whiskies as well as Lamb's® rum, Polar Ice® vodka and McGuinness® and Criollo® liqueurs. Through its affiliation with Pernod Ricard S.A., a global leader in the spirits and wine industry, Corby also represents leading international brands such as ABSOLUT® vodka, Chivas Regal®, The Glenlivet® and Ballantine's® Scotch whiskies, Jameson® Irish whiskey, Beefeater® gin, Malibu® rum, Kahlúa® liqueur, Mumm® champagne, and Jacob's Creek®, Wyndham Estate®, Stoneleigh®, Campo Viejo® and Graffigna® wines. Corby was named one of the 50 Best Workplaces in Canada by The Great Place to Work® Institute Canada for the last three years in a row. Corby is a publicly traded company based in Toronto, Ontario, and listed on the Toronto Stock Exchange under the trading symbols CSW.A and CSW.B. For further information, please visit our website or follow us on LinkedIn.